There are a few ways to accomplish the top flange (the rim or one-piece euro-brace) of a sump. Originally, I would build the sump, squeeze in pieces of wood inside the upper edge of the sump, and use a router with a ball bearing guide to trace the lumber. This was tedious, and cutting wood for each sump would end up costing too much. Later I bought an Edge-Guide that mounts to the router. Once the sump was built, I could use the edge guide to follow the outer periphery of the sump while the bit cut out the opening. This is fine, but it is possible to make an error, or even damage the sump if the center piece drops inwards too hard. Plus the sump would fill up with shavings that had to be removed afterwards. Some images of this procedure are included on this page when you scroll down quite a bit. So I decided to make a jig, which varies from one sump to the next. Below, I explain the process and hope it helps you as well. First, determine the size of the top piece, including any overhang during the gluing process. I always leave an extra 1/2" (both length and width). The flange will be 2" wide for this sump. What you see above is white MDF with thin brown screen moulding nailed in place. Using a large piece of MDF as my work surface, I bradnail the white strips in place. The area in the center between the white strips matches the actual opening of the sump. In this case, the top piece I'm using is 54.5" long, and 18.5" wide. The finished internal opening will be 50" long and 14" wide, providing a 2" wide rim plus the 1/4" overhang on all four sides that will trimmed off via router once the sump is assembled and cured. The brown wooden strips are used to hold the acrylic in place, and are 1/4" tall so they don't interfere with the router base. It can slide over them cleanly. Getting the jig ready the first time took me about 20 minutes. Now I can modify it as needed in about 10 minutes or less, reusing lumber often. The arrow is pointing to the lumber that the router will be tracing. Normally, I would use only the white MDF, but in this case I was out of it and grabbed something handy to handle the width necessary for this project. Remember, the inner edge of the frame you build should be what your finished opening size needs to be. The extra 1/4" of material on all four edges gives me a little lattitude during construction. Once the sump is glued together, any overhang is routed off, leaving a nice clean edge. The sheet is in place, and then it is clamped in a few choice spots, just in case. You don't want it to shift. Drill a hole for the router bit to go through. The router bit you must use in this project will have a bearing guide at the tip, so you can't just lower it into the acrylic (it can't cut downward). The router bit should extend deeply enough that the bearing can trace the inner edge of the lumber. It should not be so deep that it touches or drags on the MDF work surface. The blades of the bit should be at the correct depth to cut the 1/4" thick acrylic. Check closely before turning on the router. The bit is inserted through the opening, and checked to make sure the depth is set correctly. If the router is rocking back and forth, the bit is too deep. 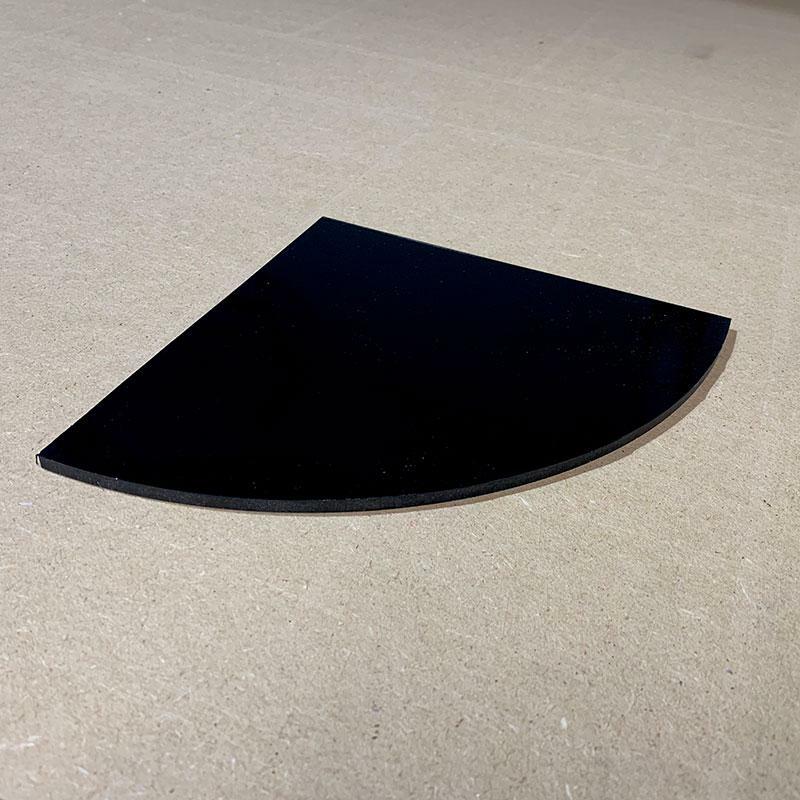 Visually inspect before you turn the router on to make sure the blade will fully contact the acrylic and the bearing will trace the inner rim of the jig. Ready! Hold your router tightly, and turn it on. Cutting clockwise within the perimeter of your jig, route out the opening. Take your time, wear safety goggles, and within about 60 to 90 seconds you'll be done. Here you can see how the router bit traced the brown lumber and cut the acrylic in a nice straight line. I used a compressor to blow out the shavings to give you a better view; normally it would be full of white shavings as you run the router around the jig. At the corner, you don't have to do anything. Just continue routing as you did the first edge, letting the bearing trace the inner perimeter of the jig. Note the clamp in the upper part of this image. If you don't clamp it, the material may wander and you'll ruin the flange. The clamps do get in the way of the router, so you'll have to move them, or route around them only to come back later and route those areas after the clamps have been relocated. Done! The center piece drops down into the opening. Remove the panel, and blow out the shavings. I suggest you run the router a second time just to clean up any burrs or spots that didn't get routed precisely the first time. And this is your final piece, ready to glue to the top of the sump. If you wanted a cross brace or two, all you would need to do is insert cross bars in the jig before starting, drill a starter hole in each section, and then route out each section. A nice clean edge. If you wanted to flame polish the inner edge with a propane torch, be sure to remove the protective film and work away from any flammable materials. I usually only flame polish the opening after the sump is built.